The frontier period in Middle Tennessee did not last long. In 1780, only a handful of years after the long hunters had hunted out the last of the game on the Cumberland Plateau, Kasper Mansker returned with James Robertson and a large party of settlers to the site of present-day Nashville. That same year saw the arrival of the Donelson party, about thirty flatboats along with numerous canoes, carrying perhaps as many as three hundred settlers, including at least thirty slaves. The first few years were hard and dangerous. The Donelson and Robertson families left almost immediately for safer territory, returning a year or a few years later. Mansker stayed. The Chickamauga Cherokees, who had lived and hunted in that land, were fiercely hostile. For the next thirteen years, the settlements were attacked on an almost weekly basis, and during some periods a man, woman or child was killed on the average every ten days. Men plowed with rifles across their plow handles; no child went outside without the supervision of an armed adult. By the end of the first year, Mansker had established his own fortified “station,” where settlers could take refuge from such attacks. Other stations up and down the Cumberland River eventually protected as many as 5000 people. 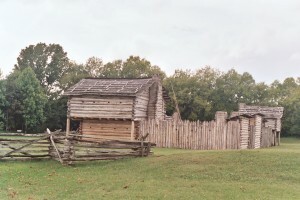 A replica of Mansker’s station—half a dozen small cabins built into a stockade of sharpened poles, with a roofed workspace and sheds for animals, guarded by two two-story blockhouses—stands today in a park in Goodlettsville, just outside of Nashville, near the site of the original fort. And a short walk away stands the Bowen house (right), an elegant two-story brick house built only seven years later, with glass windows imported from Kentucky. The original owner, Captain William Bowen, was a Revolutionary veteran who eventually acquired over 2000 acres. The house has been meticulously restored. The quarters of the enslaved people who built it have not. By the time a child born in the first year of settlement had reached her late teens, the society of Middle Tennessee had changed dramatically. When the Chickamaugas were finally defeated in 1794, the tide of settlement became a flood. By one estimate, the population of the area in 1795 was at least 10,000. By 1800 it had grown to 30,000, and inequality of wealth was higher than anywhere else on the American frontier. 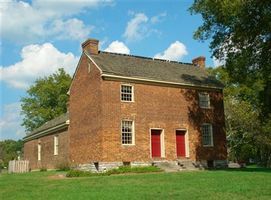 Nashville men wore, not hunting shirts and leggings, but rather linen shirts (sometimes ruffled), brightly colored silk waistcoats, knee breeches and stockings. At the stores of local merchants, women could buy velvet and satin, scarlet cloaks, calico gowns, and embroidered aprons, along with parasols, lace and ribbons. Silk rugs and parlor furniture were shipped upriver from New Orleans. By 1797, some Nashville residents were riding in carriages. Twenty years later, many of the yeoman farmers who had come looking for prosperity and independence were on the move again. Further reading: Harriette Simpson Arnow’s Seedtime on the Cumberland, based on the author’s research into hundreds of surviving manuscripts, letters, official records and other documents, draws an extraordinarily detailed picture of life in Middle Tennessee in this era.